There are many creative ways school groups can raise money for special projects or needs. Whether for a class trip to the zoo or a museum in a larger nearby city, the PTO, the middle-school girls’ softball team or the junior high band, there are countless easy school fundraising ideas that will make it possible for your organization to raise the amount of money you need. Here are a few of the best! Of course, selling products designed for fundraising purposes are always at the top of the list. Whether your group chooses cookie dough, discount cards, candles, calendars, popcorn, jerky, candy, or brochure/catalog sales, there is no shortage of products designed to help non-profit groups raise money. Before you choose which product/products you will sell, consider your unique community, their interests, overall financial status, etc. The better you know and understand your community, the easier it will be to choose a product that is most targeted to their wants, interests, and needs. 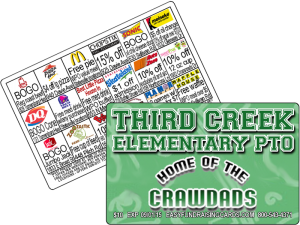 For example, if most of the people in your community are frugal and budget-minded, you may want to consider discount cards. For elementary schools, consider product fundraisers, a school carnival, or even a read-a-thon. Be sure to have plenty of fun games, food, and drink if you decide to host a school carnival – and lots of volunteers to plan and get it all together. Another great (and easy) idea for elementary school fundraising is a sale of student artwork. Art isn’t necessarily done on paper or canvas; it can be done on tote bags, t-shirts, note cards, and more. Children can be creative, and proud of the work they have done to help raise money. Middle school fundraising can be complicated, mostly because children at this age are hesitant to participate in selling products or engaging in activities, as are their parents. At this age, many children are in that “in between” stage when they aren’t really interested in anything in particular. To make fundraising more successful, the students should benefit in some way. This will help generate more interest and involvement. Other than the ideas mentioned above, consider car washes, selling raffle tickets, or holding a spelling bee. High school age teens may want to participate in a walk-a-thon or some other type of marathon. Much of the method you choose to raise funds depends on the age of the children involved, and the interests of the community. Regardless of how you choose to raise funds, include products such as fundraising discount cards on the side to add to your profits! Hopefully these easy school fundraising ideas have helped to inspire a few creative ideas of your own.